Conventional classroom Sales Training doesn’t work. This might sound peculiar coming from someone like me who has been involved in Sales Training most of my professional life. 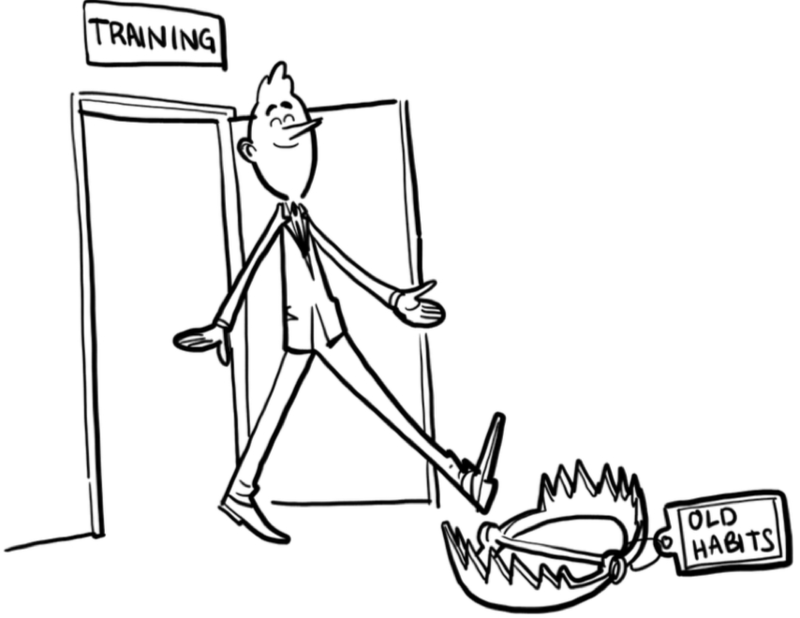 But the more organisations we work with the more I realize that it’s not how good a training is that matters, it’s how much they act on quickly that makes the difference. Companies like Infoteam have to offer new ways of delivering their services to overcome the learning-doing gap. I estimate that across the industry, training adoption is usually no more than 20%. I think we can achieve +80% adoption and I will explain how later. The 20% adoption rate is achieved when an element of the training coincides with an issue that the sales person is dealing with at that moment in time. All the other concepts that are covered in the short period of training are forgotten or badly recalled, so when it comes to apply them, the results are poor. As an example, let me tell you about a recent experience I had with a group of sales people who work for a credit card payments processor. They had attended a 2-day sales training a few months back and had given excellent feedback. I was now sitting in on a series of Opportunity Reviews where the sales people were presenting their Deal One-Pagers. Only half of them were applying the concept correctly. The other half, instead of using the Deal One-Pager to help the customer get internal buy-in, were just using it to inform their sales manager about the deal. I suppose 50% is better than the 20% I mentioned earlier, but this is not good enough. So, I showed them a concise tutorial video in our online Learning Center and within no time 100% of them understood and were applying this vital sales concept effectively. If only we could be there to coach them all the time! Not a very practical nor cost effective option. I have already said that if training content and timing does not coincide with a particular issue the sales person is facing, they won’t fully learn the importance of the concept or apply it properly. We always get sales people to bring projects they are currently working on to training sessions which certainly helps improve adoption but they rarely apply every aspect of the sales methodology in a single project. Another challenge for trainers is that people are changing the way they learn – from traditional learning to micro and mobile learning. Back in the old days, participants were happy to attend 2-day off-site trainings. Now, they want to look up what they need to know online, when and where they need it. I recently experienced this with my own son. I gave him a copy of my book Customerized Selling when it was published a couple of years ago but he hasn’t read it. When he recently asked me about B2B selling – he is trying to sell web-design services to SMBs – I gave him our online tutorials and asked him detailed questions about the content a little later. He had taken on board all the content and could explain the concepts very clearly. And it’s not just 18-year olds or even millennials who work this way, people we work with increasingly like to research just what they need to know the moment they need it. I still believe there is a role for classroom style teaching. But there has to be a full range of options available to our clients to ensure the level of adoption that will deliver the results they need. There are plenty of online learning videos but mostly they just deliver training through a different media without improving adoption significantly. The other technologies out there are the CRMs and Sales Automation tools that many organisations have deployed with mixed levels of success. The problem with these technologies is they are often designed for the benefit of sales managers rather than the sales team. The team sees little benefit to themselves when they spend time inputting information about an account or opportunity. To address the learning-doing gap and the changes in the way people learn, we have developed a technology platform that embeds our sales methodology and the learning content into systems like Salesforce. 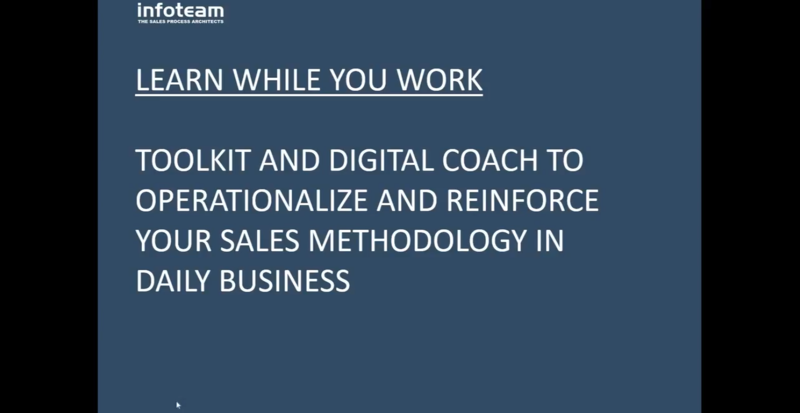 As the sales person uses the sales methodology, a Digital Coach analyses what they have entered and challenges them to make sure they are using each sales concept properly. It also provides digital learning content in the form of videos, blogs and infographics about how to use that particular concept effectively. You can see a demo below. The sales people get the sort of micro and contextual learning they prefer. Sales operations gets greater adoption of their CRM system because sales people see it as something useful instead of just administration and the sales leaders get greater adoption of required selling skills. It’s the closest thing to having a sales trainer leaning over the shoulder of every sales person offering them coaching. Of course, this is not a magic bullet and it won’t replace all other sales training but it adds a powerful new approach to the mix. It’s early days but the results we have seen so far are very impressive.